Hillary Clinton's burgeoning presidential campaign is off to a rocky good start. Just a day after papers reported that the former Secretary of State would make a bid for the nation's highest office in April, The New York Times reports that Hillary Clinton used only her personal email address while serving as Secretary of State. This is bad for a lot of reasons. For one, it's absolutely insane to imagine that a government official so high up on the totem pole wouldn't even have a government address. Hillary didn't have one. Why would she? She only used her personal email address while she was acting as America's highest ranking diplomat, forging peace deals and fighting wars. We already knew that Clinton was receiving private advice from a banned, Obama-hating former staffer. Now, we're learned that she apparently tried to hide behind a private account completely. This is so bad! This is also unprecedented. In the words of one Times source, a former National Archives employee, no executive branch employee as high-ranking as Clinton has ever exclusively used a personal email account for all official business. He said that no scenario "short of a nuclear winter" would call for this. The situation does bring to mind a 2013 scandal during which several Obama appointees were accused of having "secret" email addresses—that is, unmonitored accounts where they could conduct official business off the record. The White House denied that anything was kept secret. This is inevitably just sad, though. Clinton's habit of conducting official business solely through her personal email address came to light during the Benghazi investigation. 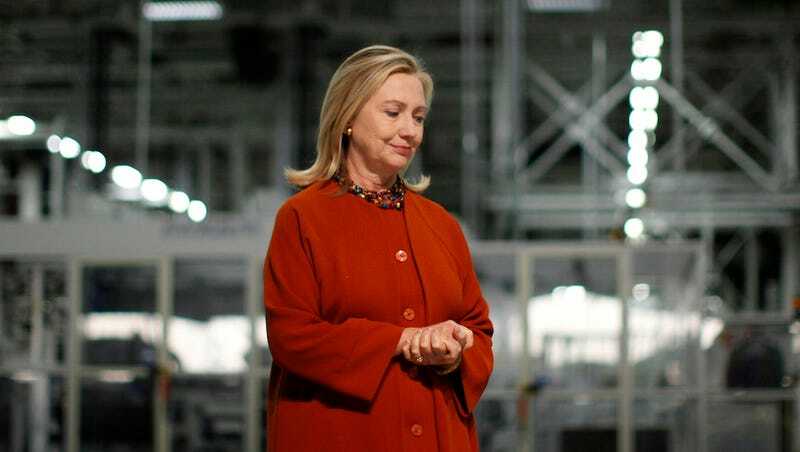 As part of an inquiry into whether the former First Lady violated federal requirements, Clinton's advisors handed over some 55,000 of her personal emails to State Department officials recently. However, these were cherry-picked by those advisors, so it's unknown exactly how large her personal email archive could be. It's also unknown whether or not she used encryption or any security measures to protect those highly sensitive communications.